It’s warming up, and many of you are no doubt getting ready to pack up your trailers and enjoy the great outdoors. Whether you’re pulling a camper or a boat, making sure you’ve loaded up properly and know how to safely handle your vehicle. We’ve put together a quick guide here for those of you that could use a refresher on how to get your rig going. Get the right equipment to get loaded up. For instance, depending on what you’re towing, you might need a weight distribution hitch to shift some of the tow weight to the tow vehicle’s front axle. Stop by Auto & Truck Accessories and we can help you achieve a well-balanced setup. Get your vehicle’s tongue weight set properly. If your trailer is too back weighted, for instance, it will sway as you’re driving. If you’re not in the habit of doing slight movements while towing, this can create big swaying action that can drag you across multiple lanes of traffic, or worse if the road doesn’t have multiple lanes to be dragged across. 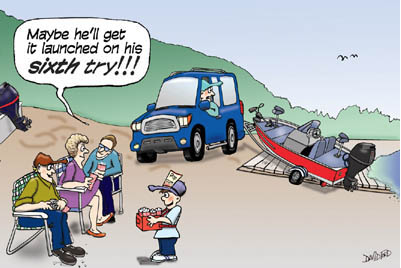 Pay attention to your vehicle’s rated towing capacity. Don’t load up more than you can safely pull, otherwise, you’ll notice poor performance and handling while you’re out on the road. Mind your engine when you’re going up hills. Don’t redline your engine or let it overheat. Pay special attention to this if you’re pushing your vehicle to the limit by using the upper end of your vehicle’s towing capacity. Stop gently and gradually, especially when you’re driving downhill. Your tow vehicle absorbs anything that the trailer brakes aren’t stopping. Minimally, poor braking habits will wear down your tow vehicle’s brakes, but you can also jackknife if the momentum of your trailer suddenly overpowers the tow vehicle. Empty out your trailer’s water and waste tanks before you hit the road. The reduced weight will improve your fuel economy. If you’re not confident in your ability to back up with a trailer, practice a little before you begin your adventure. Remember that slight steering inputs create big changes in your trailer. When you pull up to your destination, don’t be the one everyone is staring at, betting on how many attempts it will take for you to back in properly. We hope we were able to provide some helpful tips for you. If you’ve got any questions for us, just let us know. We’ve helped many people tow lots of different things over the years, so we’re happy to share our experiences about what’s worked well for others with you. Wherever your warm weather escapades take you, we hope you stay safe and have a blast.